Hillary Harpster - "TravelAgent's 30Under30 Award Winner 2017"
"The future of the travel industry, the next generation of agents who will discover new places to go and new ways to connect with travelers. Here are Travel Agent’s top 30Under30 for 2017, which represents the 10th year of the program." Congratulations to this year's T+L World's Best winners! How many of these World's Best have you visited? Share your score the comments section! 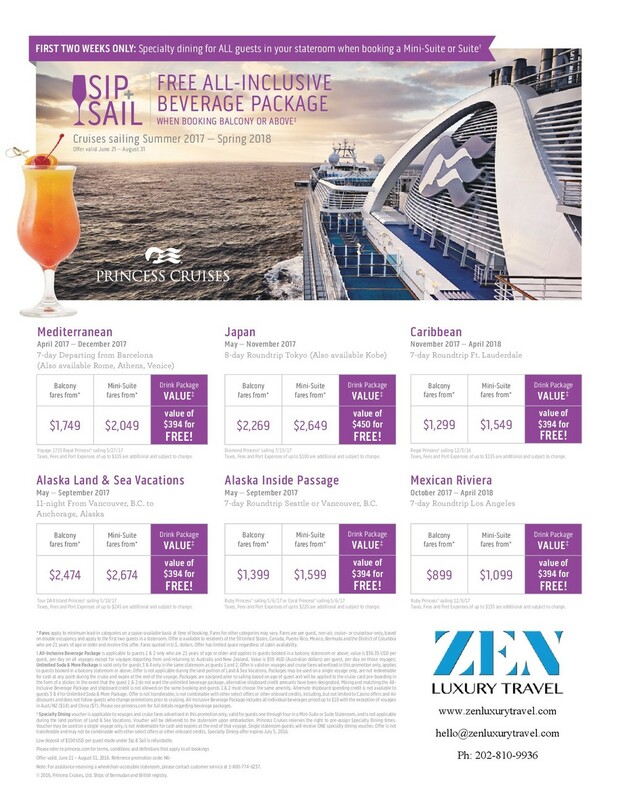 Book a Princess Cruise through ZEN Luxury Travel now until July 5th and enjoy a FREE Beverage Package PLUS FREE Specialty Dining on select sailings! An agent will contact you shortly to discuss the best options for your Princess Cruise! Legendary tenor Andrea Bocelli will be joining us for a second time for a unique performance aboard Silver Spirit. The world’s most beloved tenor and best-selling solo classical artist of all time will be performing an exclusive evening of arias on the 26th of October, 2016 during Voyage 5631. Set against a backdrop of the stunning coastal village of Sorrento, your client(s) can enjoy an evening of powerful beauty as Maestro Bocelli performs in his unique style to a selected audience. We are offering your the incredible opportunity to attend this performance — space is limited and will be reserved on a first-come, first-serve basis. We urge you to call ZEN Luxury Travel today to reserve your suite as Silversea expect's an unprecedented response for this momentous event. Enjoy the benefits of Virtuoso when you book with ZEN Luxury Travel, an independent contractor of Cadence. From room upgrades, dining credits, and late-checkouts to shipboard credit, insider information, and perfectly planned itineraries - You're in good hands with ZEN Luxury Travel. Strolling a favorite beach promenade in Dubrovnik. Fly-fishing on a river in Ireland’s County Kerry. Pedaling along Amsterdam’s canals. Railing aboard a high-speed TGV that hugs the hypnotizing Mediterranean coast. Such authentic experiences happen daily when you explore the Continent with Virtuoso. Of course, ZEN Luxury Travel can provide exclusive extras and personal connections to show you a side of Europe even most locals never dream of. Amsterdam’s picturesque canals are perfect for leisurely bike rides; Big Ben looks small from atop the London Eye; friendly archery contests hit the target in Ireland’s County Kilkenny; and a behind-the scenes tour of St. Petersburg’s Mariinsky Theatre has you dancing for joy. Dive into the dazzling Aegean waters off Mykonos, get squared away in Madrid’s “Triangle of Art,” taste fresh mozzarella at a farmhouse in Sorrento, and relax with a good tome in a private garden within the center of treasures-filled Florence. ZEN Spring Cruise Sale Ending Soon! The time has come for amazing savings and exclusive promotions for new reservations with your favorite cruise brands. Now is definitely the time to book. See something you like? Contact us today to start planning. Receive up to $500 in shipboard credits per cabin. Combinable with any other current promotions! 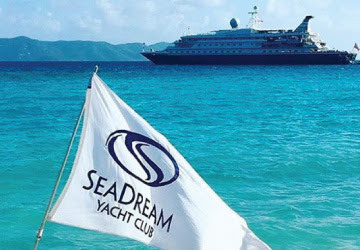 Save up to $1,000 per cabin on ocean and yacht cruises and up to $400 per cabin on river cruises. 3rd & 4th guests are FREE until April 30th! Receive up to $200 in shipboard credits on select cruises, exclusively through Cadence. Discounted or free flights and up to $3,000 per couple on select cruises. Combinable with the Virtuoso® prepaid gratuities offer on select 2016 Europe cruises. Complimentary specialty dining for two in Oceanview and above categories and up to $200 in shipboard credits per cabin for European itineraries. Pay a reduced deposit ($100 for 7 day sailings, $200 for 14 day sailings) and our Onboard Value booklet, worth $300. 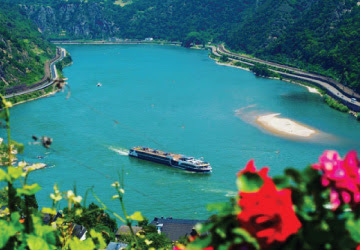 Up to $3400 savings per couple on 2016 Europe sailings! PLUS free internet & your choice of three amazing deals: up to $800 in Shipboard Credits, 4 shore excursions or a beverage package! Save up to $300 per cabin all 2016 sailings- and up to $600 on select voyages! Save $250 per suite on Classic Cruises and $500 per suite on Expedition Cruises. Contact us by April 30th to book! TERMS & CONDITIONS APPLY. SAVINGS VALID ON NEW BOOKINGS ONLY.